Michael Buble is an Italian and Canadian singer, songwriter, record producer, and actor. His songs are mostly based on Traditional pop, easy listening, pop rock, jazz, and vocal jazz genre. The 43-year old singer is the winner of four Grammy Awards and several Juno Awards. Michael Buble performed the cover of "Where or When" by Frank Sitara on Tuesday night at the 15th season of The Voice semifinal. Previously, in an interview, Buble was quoted that he would be retiring from music after the release of his album, "Love", as his son, Noah was diagnosed with liver cancer and he is done with celebrity narcissism. The Haven't Met You Yet singer has also claimed that his interview with Daily Mail would be the last interview, and his album Love would be his last to the industry. However, his management stated that his interview was falsely interpreted and the rumors of him retiring was not true. The singer himself has already announced that he will embark on a tour, "Don't Believe the rumors" in 2019 in the honor of his tenth studio album, "Love". The tour will kick off from Tampa on 13 February 2019. He also stated that the album would be based on compassion to move him past the struggles of his son's battle with cancer. His tenth studio album was released on 16 November 2018, which debuted at number 2 on the Billboard. The full name of Michael Buble is Michael Steven Buble. He was born on 9 September 1975 in Burnaby, British Columbia, Canada. His father is Lewis Buble and his mother is Amber Buble. He has two younger sisters named Brandee and Crystal. He was raised in the Roman Catholic faith. In an interview with Oprah Winfrey, Buble stated that his desire to become a famous singer came just at the age of two. Buble attended Seaforth Elementary School and Cariboo Hill Secondary School. During his school career, he wanted to become a professional hockey player for the Vancouver Canucks. Thus, he often played hockey and used to watch the Vancouver Canucks game. Buble grew up listening to jazz music. His songs are often influenced by jazz music. Buble started singing at the nightclubs, arranged by his grandfather, at the age of 16. Back then, he used the name "Mickey Bubbles" as a stage name. Buble won a local talent contest and Canadian Youth Talent Search at the age of 18. He then started performing at clubs, cruise ships, shopping malls, hotel lounges, conventions, and other talent shows. In 1997, Buble first appeared in national TV in an award-winning Bravo! a documentary titled Big Band Boom!. Buble gained more exposure after he became a frequent guest on Vicki Gabereau's national talk show on the CTV network. Buble released his first independent album titled First Dance in 1996, Babalu and Dream in 2001 and 2002 respectively. In 2000, Buble performed at the wedding of former Prime Minister, Brian Mulroney's daughter Caroline. He was invited at the wedding after Michael McSweeney, an aide to former Prime Minister saw Buble's performance at a business party, and showed the Buble's independent album to the Mulroney and his wife. In the early 2000s, a multi-Grammy Award-winning producer and record executive, David Foster signed Buble, whereas Buble signed Bruce Allen as his manager. Buble released his self-titled debut album on 11 February 2003. His album achieved No. 1 in Australia, top 10 in United Kingdom, South Africa, and Canada, and top 50 on the Billboard 200. His albums contained songs like "Fever", "The Way You Look Tonight", "For Once in My Life", "Moondance" etc. Buble performed his first World tour in mid-2003. In November 2003, Buble released a Christmas EP Let it Snow. In early 2004, Buble released a live DVD/CD titled Come Fly With Me. In 2004, Buble won New Artist of the Year at the Juno Awards. His album was also nominated for the Album of the Year. 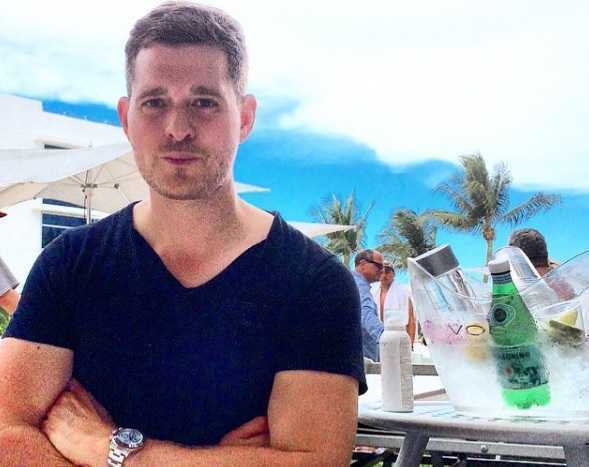 Buble appeared in the film The Snow Walker, tv series Days of Our Lives, and appeared as himself in Las Vegas, co-starred in the film Totally Blonde. Buble released his second studio album titled It's Time on 15 February 2005, which includes "You Don't Know Me", "Feeling Good", "Can't Buy Me Love", "Save the Last Dance for Me", "Song for You", "Home", and "Quando, Quando, Quando". The albums achieved No. 1 in Canada, Japan, Italy, and on the Billboard Top Jazz chart. The album remained on the Billboard Top Jazz chart for 104 weeks, including a record-breaking 78 weeks in the No.1 spot. In 2006, Buble won four Juno Awards(Single of the Year, Artist of the Year Album of the Year, and Pop Album of the Year) for his album It's Time. Buble released his third studio album titled Call Me Irresponsible on 1 May 2007, which includes songs like "Everything", "Lost", "Always on My Mind", "Dream", I've Got the World on a String", and "Comin' Home Baby". The album became best-selling 2007 album of the year in Australia. Buble released his fourth studio album titled Crazy Love in October 2009, which includes songs like "Haven't Met You Yet", "Hold On", and "Cry Me a River". The album won four Juno Award in 2010. In 2009, Buble appeared on tv program My Musical Brain. In 2009, Buble was a celebrity mentor for the finalists in the sixth series of The X Factor. Buble re-released special edition of Crazy Love titled "Crazy Love: Hollywood Edition" in October 2010, which included several bonus tracks including his hit "Hollywood". Buble released his fifth studio album titled Christmas in October 2011. Buble participated in the torch relay in Vancouver before the opening ceremony of the 2010 Winter Olympics. Buble released his eighth studio album titled To Be Loved in April 2013, and ninth studio album titled Nobody but Me in October 2016. 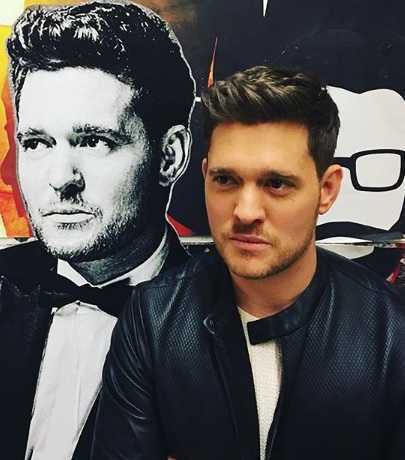 Buble released his first single "When I Fall in Love" from his tenth studio album titled Love on 27 September 2018. In October 2018, Buble announced in an interview that he would be retiring from music. His album "Love" would be his last album. Buble is married to Argentine actress Luisana Lopilato. They started dating in late 2008 and got engaged in November 2009. They tied a knot to each other in March 2011 in Buenos Aires. The couple is blessed with two sons named Noah and Elias, and a daughter named Vida. Previously, Buble was engaged to actress Debbie Titmuss. However, they split in November 2005. Buble also dated British actress Emily Blunt in 2005. Their relationship ended three years later in 2008. In 2005, Buble acquired Italian citizenship and has a dual Italian-Canadian citizenship now. As of 2018, the net worth of Michael Buble is estimated at $60 million. He is one of a successful singer who has sold 75 million albums across the globe. In August 2016, his perfume went on sale in thirty countries worldwide. Bublé is a Croatian last name from the town of Trogir. His grandparents were natives of Croatia. Buble used to work as a commercial fisherman with his father from the age of 14. Previously, Buble used the name "Mickey Bubbles" as a stage name when he was singing in the nightclubs. Buble performed in front of 100,000 people at the Aviva Stadium in Dublin. It was his biggest concert ever to date. Buble was a celebrity mentor for the finalists in the sixth series of The X Factor.